« Superheroes Unite! Bullying Is Everyone’s Problem. 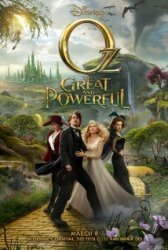 The evergreen classic, Wizard of Oz gets a fresh new look in Disney’s new version, Oz The Great and Powerful starring James Franco, Mila Kunis, Rachel Weisz and Michelle Williams. Here, we have the tall tale about a circus magician, Oscar Diggs (James Franco), who dreams of becoming a great wizard. He sets off in a hot air balloon only to encounter a tornado that sweeps him away to the brilliantly enchanting 3D world of Oz. Seeing this as an opportunity to make something of himself, Oscar (aka Oz) convinces the good people that he is the great wizard they have been waiting for. Once he realizes that being the king of this great land is more work and less play, he has to decide whether or not to stay and protect the people that look up to him most, or continue in his ways of being a scammer. Our KIDS FIRST! Film critic, 15-year-old Raven Devanney recently attended an advance screening and shares her review below. This movie is beautiful! The CGI is breathtakingly clear and crisp and the 3D pops. I especially love the opening credits which are done in black and white and look like vintage pop-up books. I also love that when it shows dusty Kansas it is in black and white and the screen is small, but as soon as you reach Oz, the images morphs into vivid colors and the screen widens to reveal Oz in all its splendor. The musical score in this film is wonderful. The composer, Danny Elfman, keeps it lively and whimsical, while diming the mood of the music when the moment is right. My favorite characters are Oz, played by James Franco and Finley, voiced by Zach Braff. I like Oz because he is so cheesy and such a con man. He always plays girls and lies his way through every possible opportunity. But, Franco does it in a tasteful way that brings cleverness and humor to the film. I also like Finley who is Oz’s assistant, an adorable little flying monkey. He is always making the funniest comments and is so honest. There is one scene when he is trying to distract someone, and he does the funniest things. I like how original this plot is because there have been countless numbers of films, plays and stories based on the Wizard of Oz, but I haven’t seen one like this. It is a predictable story line which is usually a thumbs down for me, but this film is so good that it works. The land of Oz is so beautiful and uniquely designed, it is very visually pleasing. There are definitely some jump scares in this film because of the wicked witches, baboons and the evil forest. So, parents taking children, be advised that they may get frightened. I give Oz: The Great and Powerful 5 out of 5 stars and recommend it for ages 8 and up. Check out other great video reviews from our KIDS FIRST! Film Critics Anthony Aranda and Cheyenne Nguyen! This entry was posted on Monday, March 11th, 2013 at 1:52 pm and is filed under Jury Updates. You can follow any responses to this entry through the RSS 2.0 feed. Both comments and pings are currently closed.